On University at Albany Week: Communication is always key. 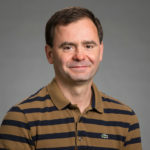 Tolga Soyata, associate professor in the department of electrical and computer engineering, discusses how to better communication for those who can’t speak or type. Tolga Soyata is an associate professor in the College of Engineering and Applied Sciences at University at Albany, SUNY. He joined the faculty in the Department of Computer Engineering as an associate professor in 2016. He was formerly at the University at Rochester, where he was an assistant professor-research. His teaching interests include CMOS VLSI ASIC Design, FPGA-based High Performance Data Processing System Design, and GPU Parallel Programming. His research interests include Cyber Physical Systems, Digital Health, and GPU-based high-performance computing. Electroencephalography, or EEG, systems capture brain signals from a person’s scalp through a device that is worn on their head. These signals are related to the brain activity during when a person is thinking or performing an actual physical activity. A Brain-Computer Interface, or BCI, is a system that processes these signals using a computer, which can allow a patient to communicate with the outside world through just thinking. A BCI Speller is a machine that lets a patient spell words one character at a time using a screen and an EEG hat. The patient is not required to type or speak while using this system; so, a BCI Speller can be used as a communication device for a patient who lost their motor skills, for example, after a stroke. While useful, BCI Spellers suffer from speed and accuracy issues. The speed at which a person can type using a BCI speller is generally only a few words per minute. Additionally, because of the high noise content in EEG signals, the accuracy at which the computer identifies the characters is typically 70 percent. This makes the BCI spellers impractical for many patients and causes frustration when the computer identifies the letters wrong. Most of the existing BCI Speller algorithms were developed when the computational power was not so abundant a decade ago, or even earlier. However, by using today’s Graphics Processing Units (GPUs), a system can incorporate a near-super-computer power. In my research, I leverage this very fact to build a completely new type of BCI Speller that is far more accurate and can reach near real-time speed using a new generation of algorithms and hardware. My research can help patients with certain neurological diseases by understanding their operational pathways on the brain and formulating a BCI-based cure for them.